Printing Urethane Wheels are a popular demand due to the exceptional quality they have to offer. These Printing Urethane Wheels are manufactured at Plan Tech with the application of speed and accuracy to meet the high volume demand of our customers and prospects in record timing. To ensure that our printing urethane wheels are consistent of high quality, we only make use of the best raw materials that are produced by world-renowned chemical companies. We have been manufacturing first-rate custom manufactured polyurethane components and products for over three decades and rarely if ever have our productions fallen short of the expected quality. 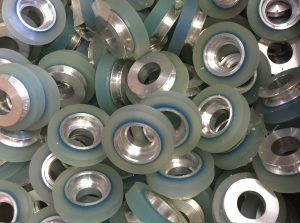 Our printing urethane wheels can be relied upon for their outstanding ability to resist harsh weather conditions, chemicals, abrasion, corrosion as well as unfavorable environments. With our printing rubber wheels, you can expect nothing short of an overwhelming experience that will guarantee maximum satisfaction. So, if what you’re looking for is printing urethane wheels that offer good value for money with their remarkable physical properties. Then Plan Tech’s printing wheels are the ideal choice for you. And the best part is that our team of engineers can custom make your printing urethane wheels according to your idea to meet your specific requirements. To ensure these parts are highly efficient the entire designing process will be based on maximizing the efficiency of the primary properties while the secondary or less important properties of the parts will be undermined. Below is a list that demonstrates the clear or easily comprehensible processes that are involved in the build-up or development of standardized cast urethane parts. Are you interested in printing urethane wheels? Please Contact us so we can help solve your requirements and work with you on your specific application!